APswreis Faculty Recruitment in on on 21-02-2019 and Online applications are inviting from the interested and eligible candidates for filling up the Faculty posts in the AP Social Welfare IIT NEET Coaching Medical Academies. 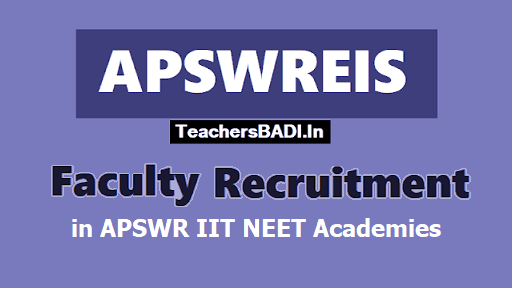 APSWREIS Faculty Recruitment, Faculty Recruitment Online application form, Faculty Recruitment APSWR IIT NEET Coaching Academies 2019, APSWR IIT NEET Medical Coaching Academies Campus Directors, Faculty Recruitment 2019: APSWREIS has published the Faculty Recruitment notificatiSchedule, Eligibility Criteria, Schedule, Selection Procedure and more details are given here. Further more details please visit the official website. The A.P. Social Welfare Ministry had invented a separate wing, termed APSWREIS in 1984 for the educational needs of SC/ST/BC children within its domain. Major motto of Society is to provide School and Intermediate education to girls and boys, through 188 institutions spread across the breadth and length of the state. Society takes care of every student needs and monitors systematically. Besides, it prepares the students for a better future by imparting special coaching for IIT, NEET, AIEEE and EAMCET to Class 11 & 12 students through APSWR IIT NEET Coaching Academies (APSWR IIT Medial Academies). APSWREIS IIT NEET Medial Academies are hiring faculty (Maths, Physics, Chemistry, Botany, Zoology, English and Telugu) for all our IIT NEET Coaching academies (Class 11 & 12 Students). The Campus Director directs, manages, monitors and maintains control of all aspects of campus operations for an Andhra Pradesh Social Welfare Residential IIT Medical Academy. • Ensures compliance with APSWREIS policies, procedures, practices and philosophies. • Guides and monitors all aspects of academics to ensure that quality educational opportunities are provided to students. • Supervise effective working of all subordinates and provide business and managerial assistance to all and develop effective team. • Develop various new academic programs and provide modification to all current programs. • Administer all student admission process and ensure achievement of all objectives of IIT Medical Academies. Salary is not a constraint and will depend on the Candidate's current profile. knowledge related to IIT JEE and NEET / AIIMS. • Be proactively involved in coaching students as per APSWREIS philosophy. • Motivating, facilitating, teaching, according to the pupil's educational needs. • Preparing weekly assignments for each batch assigned to him/her. • Timely correction and marking of assignment work carried out by the students in class and elsewhere. • Assessing, recording and reporting on the development and progress ofstudents. • Communicating, consulting and providing feedback to the parents of students during PTM or as and when the requirement / need arise. • Participating in trainings and meetings arranged by the management for any of the purposes described above. • Participating in periodic performance reviews. • Graduates and Post Graduates from IIT, NIT or other premier institute will be preferred. • Candidate must have a proven track record of Teaching for IIT JEE or NEET. • Work Experience from national level Coaching Brands will be given preference. • Must have experience in following time bound lesson plans. • Must possess excellent presentation and English communication skills. • Should be willing to relocate to a school project location if the need arises. All the selected candidates should join our(APSWERIS) IIT Medical Academies from 1st April 2019.